Have Wife Will Travel: One Cheap Date!! 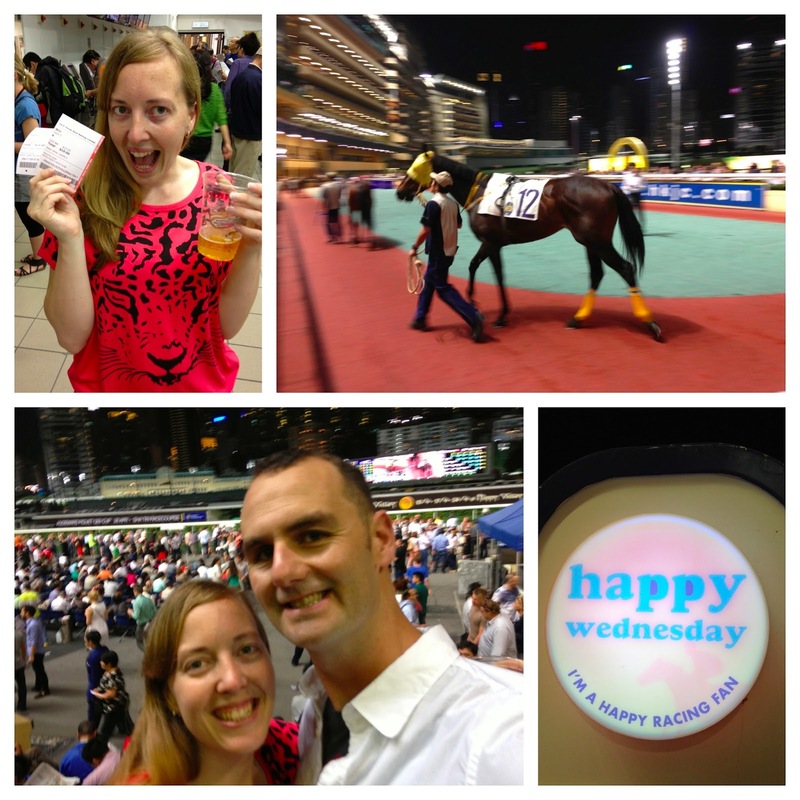 Out of a sense of fun, and nostalgia, we went to the horse races, at Happy Valley Racecourse, along with the rest of Hong Kong!! And man, what a cheap (and very fun) date it was indeed!! After a 10 minute walk from Christian and Megan's apartment, we rode the tram (or the "clackety clack" as I have taken to calling it) to Happy Valley for a whopping $2.30 HKD (about $.30 US), and after a bank-blowing entry fee of $10 HKD ($1.25 USD) we were in!! 4 beers (among 2 of us, for the evening) for another $32 HKD each, and we were off to the races (so to speak)! We bet on two horses in race 5 (Nostalgia - because that's what we were at the track for, to walk in George and Mary's steps, and Twin Turbo - because obviously!). Twin Turbo did pretty well, but 4th place doesn't win anything, and Nostalgia did about as well as you would think, seeing as nostalgia isn't really an emotion that comes racing into the finish line. He sauntered across the line rather lazily, 2 full horse lengths behind the others, losing us $10 HKD. For race 6, we bet $20 HKD on Happy Champion (again, pretty obvious picking here) to "place" (there is no bet for "show" in Hong Kong). We got settled in to wait for the race to start, and then they were off! Happy Champion wasn't even in the first half of the pack until the final stretch, as he moved into position. And then, by a horse's nose, he came in 3rd place. We lost!! Or so we thought. Turns out placing a bet to "place" in the US means the horse needs to come in 1st or 2nd. But in Hong Kong, it means they need to come in 1st, 2nd or 3rd. We won!! All in all, we placed $40 HKD in bets, and won $36, for a total loss of $4 HKD (yep, that's about $0.60 US). And the grand total for an awesome date out on the town including drinks? $161 HKD...or $23 US. Boo yah! And, it turns out, as I review George and Mary's book after our visit to the racecourse, that we were there just 102 years and one day after they were!! Reading their description of Happy Vally being to the right of Hong Kong makes it so clear how much this city has grown since then, as the racecourse is smack dab in the middle of Hong Kong now.